We are pleased to announce the Public Preview of the Azure Data Lake (ADL) Tools for VSCode. The tools provide users with the best in class light weight, keyboard focused authoring experience for U-SQL as an alternative solution to the Data Lake Tools for Visual Studio. By extending VSCode, leveraging the Azure Data Lake Java SDK for U-SQL job submission, and integrating with the Azure portal for job monitoring, the tools provide a cross-platform IDE. Users can run it smoothly in Window, Linux and Mac. The ADL Tools for VSCode fully embrace the U-SQL language. User can enjoy the power of IntelliSense, Syntax Highlighting, and the Error Marker. It covers the core user scenarios of U-SQL scripting and U-SQL extensibility through custom code. The ADL Tools seamlessly integrate with ADL, which allows user to compile and submit jobs to ADLA. 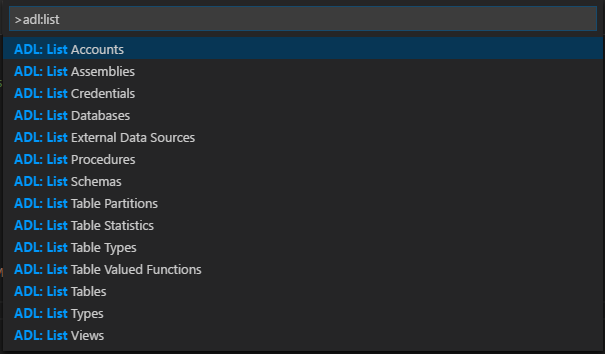 What features are supported in ADL Tools for VSCode? The ADL Tools for VSCode allows users to fully utilize the power of U-SQL: a language you’ll be comfortable with from Day One. It empowers users to enjoy the advantages of U-SQL: process any type of data, integrate with your custom code, as well as efficiently scale to any size of data. U-SQL combines the declarative advantage of T-SQL and extensibility of C#. Users can create a VSCode U-SQL job in a file format with usql file extension, and leverage the full feature set of U-SQL language and its built-in C# expressions for U-SQL job authoring and submission. ADL Tools for VSCode enables user to fully leverage U-SQL extensibility (e.g. UDOs, UDFs, UDAGG) through custom code. User can do so either through registering assembly or using Code Behind feature. The Register Assembly command allows users to register custom code assemblies into the ADLA Metadata Service so that users can refer to the UDF, UDO and UDAGG in their U-SQL scripts. This functionality allows users to package the custom code and share the functionality with others. 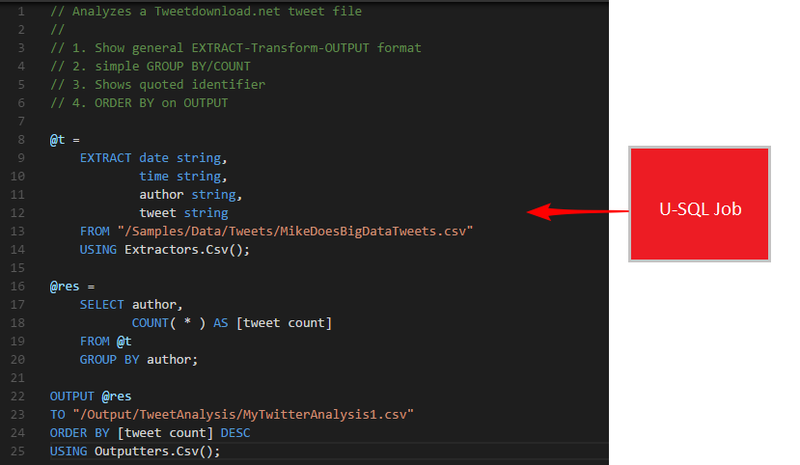 It creates a .CS C# codebehind file and links it with the original U-SQL file. It compiles the codebehind into an assembly under the codebehind folder. It registers and unregisters the codebehind assembly as part of the script through an automatic prologue and epilogue. 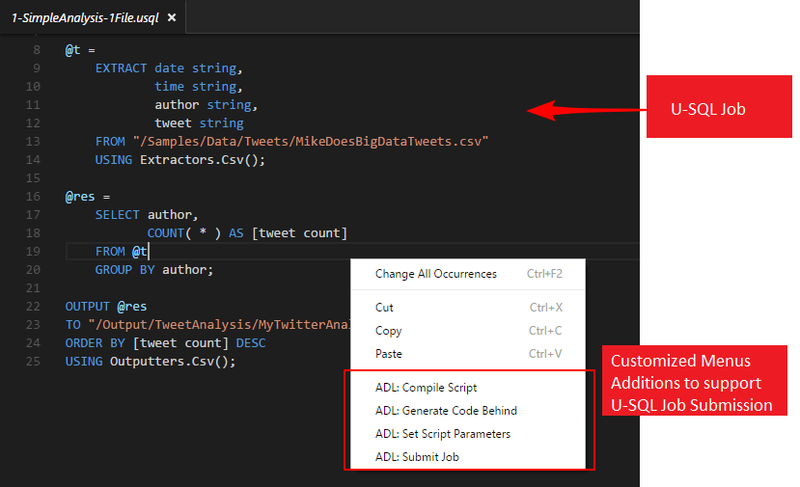 The ADL Tools for VSCode integrate seamlessly with Azure Data Lake Analytics (ADLA). Azure Data Lake includes all the capabilities required to make it easy for developers, data scientists, and analysts to store data of any size, shape and speed, and do all types of processing and analytics across platforms and languages. U-SQL on ADLA offers Job as a Service with the Microsoft invented U-SQL language. Customers do not have to manage deployment of clusters but can simply submit their jobs to ADLA, an analytics platform managed by Microsoft. Upon signing into Azure, users can view his / her ADLA Metadata entities through a list of customized VSCode command items. The workflow and steps to navigate through ADLA Metadata based on its hierarchy are managed through a set of command items. The ADL Tools for VSCode allow users to submit the U-SQL job into ADLA either through the Submit Job command in the command palette or the right click menu in U-SQL file. Users can either output the job to ADLS or Azure Blob storage based on their needs. The U-SQL compilation and execution is performed remotely in ADLA. You need to first install Visual Studio Code and download the prerequisite files including JRE 1.8.x, Mono 4.2.x (for Linux and Mac), and .Net Core (for Linux and Mac). Then get the latest ADL Tools by going to the VSCode Extension repository or VSCode Marketplace and searching Azure Data Lake Tool for VSCode. Please visit the following link for more information. Learn more about today’s announcements on the Azure Data Lake Blog. Discover more Azure service updates.